Hahn Substations are skid-mounted for easy installation with Bolted Couplers for connection of High Voltage Cables. 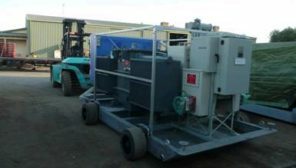 All skids offer oil containment and meet Australian Standards and Mines Regulations for installations in underground and surface mines (except coal). These portable substations are available in various capacities up to 3 MVA and in various High Voltage and Low Voltage configurations.